This insurance fee is compulsory and all occasion. Your pet is ready to leave now but the insurance has to be paid first before we can ship. You still have up to 70 minutes before departure so if you can make payment within that period, we will be able to meet up with time and put your sphynx on board. We are sorry for any inconveniences this might cause you but be well assured that we will refund you once delivery is done. The agent handling your delivery will pay your refunds in cash as soon as you are picking up your pets. 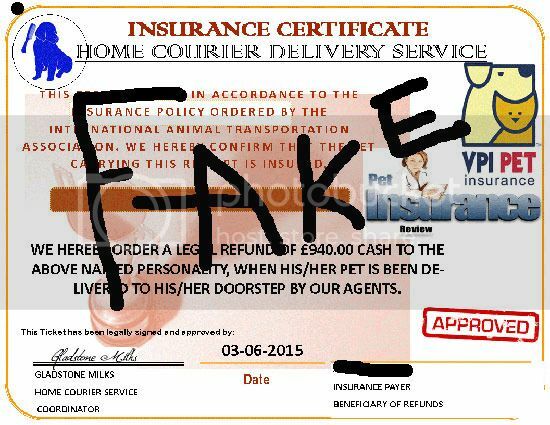 All other paper works are correct regarding this delivery and pet documents, so the only thing left now is the insurance which we must confirm before departure. Thanks for your understanding. If you will like to pay to us directly, please make a request for us to send you information for payment. We shall be waiting on your feedback as you reply to this email. Pay for your pet's insurance at the time of service. Once your policy's deductible is met, you are reimbursed according to your plan's benefit schedule or your submitted expense-which ever is less. HERE IS (PET HEALTH CARE) AND CUSTOM DEPARTMENT. (2) NOTIFY US WITHIN FORTY EIGHT (48) HOURS FROM THE TIME OF SHIPMENT OF ANY MAJOR PROBLEM. UNDER NO CIRCUMSTANCES HOWEVER WILL I BE RESPONSIBLE FOR ANY EXPENSES INCURRED BY YOU. 1:THE INSURANCE PAPERS FOR THIS PUPPY HAS TO BE PAID BEFORE SHIPPING. WE REQUIRE THE INSURANCE COST FOR THE SAFETY OF THE PET ON THE FLIGHT IN CASE OF ANY PROBLEM AS THE PUPPY WILL BE TAKING A TRANSIT FLIGHT AT VARIOUS TERMINALS.THE INSURANCE COST IS REFUNDED WHEN YOU WILL BE PICKING UP THE PUPPY AT YOUR RECEIVING AIRPORT OR AT YOUR DOOR.THE INSURANCE IS VALID FOR 48 HOURS FROM THE TIME THE PUPPY HAS BEEN DELIVERED.THE INSURANCE COST IS REFUNDED UPON PRESENTATION OF A VALID IDENTIFICATION PAPER OR A DRIVING LICENSE AT YOUR DOORSTEP BY THE RECEIVER OF THE PUPPY .WE JUST NEED THIS INSURANCE TO COVER THE PARROT ON TRANSIT. 2:PETS CHECKED UP.ALL PETS AND ANIMALS ARE CHECKED UP AT THE PET BAGGAGE DEPARTMENT PRIOR FOR SHIPMENT.A VET DOCTOR IS RESPONSIBLE FOR THIS AND IT IS DONE TO ENSURE THE PARROT HAS MET UP WITH INTERNATIONAL REGULATIONS ON ALL VET CERTIFICATES AND HEALTH PAPERS. SO YOU WOULD HAVE TO GET ITS INSURANCE PAPERS RENEWED AND GET THE VET INSPECTION FEES PAID AS SOON AS PAYMENT IS DONE,THE PARROT WILL BE SHIPPED TO YOUR ADDRESS. -TOTAL................. ........&700 OF WHICH $500 WILL BE REFUNDED TO YOU UPON DELIVERY OF THE PUPPY AT YOUR HOME. - The $700 you are going to pay will be returned to you when your pet is delivered to you at your home by the delivery man in CASH. - You get a compensation fee of $500 if should any disaster fall upon your pet. This fee will be transferred to you 3 hours after the disaster. Hi, i'm not entirely sure if I was also scammed, but my boyfriend had bought puppies from A guy off craigslist who I thought lived in Minnesota. He was positive that they were insured, vaccinated, and all of that good stuff, and told us in text that they would be in New York on May 11 around 6:15 am. Me and my boyfriend woke up at 4:30 a.m and made our way down to JFK airport expecting a phone call on whether our 2 Siberian Husky puppies arrived. We got home, no call or anything informing us of their arrival. After we returned home, we get an email 4 hours later telling us that our puppies have no life insurance and that we have to pay a minimum of $875 for a partial life insurance to get them here. I have no idea if is a scam or not, but please determine for yourself because I'm totally at a loss for what to do or what to think of this. This is an automatic e-mailing device, please mail our client(s) office with this e-mail :[email protected] for your Puppy's flight confirmation number..' displayed, because it contains errors..
IPATA DEFRA Pet Travel Scheme British Airways World Cargo Qantas Freight Air New Zealand Animal Transportation Association. Crusader was a 55-pound black Lab mix and was kept in a cage when he arrived with the other animals at Newark Liberty International Airport earlier this month. From AP Photo by Mike Derer. (2) HOURS FROM THE TIME OF SHIPMENT OF ANY MAJOR PROBLEM. UNDER NO CIRCUMSTANCES HOWEVER WILL I BE RESPONSIBLE FOR ANY EXPENSES INCURRED WE HAVE DESIGNED A SIMPLE CLAIMS PROCESS TO MAKE SURE YOU GET YOUR REIMBURSEMENT AS QUICKLY AS POSSIBLE OK.
# Following a compromise between the USA Aviation's Complaint Commission and Financial Commission, it was concluded that "The life of all pets Being transported within the USA or from one state or country to another country or region will be insured and this insurance fee should vary from one pet to another depending on Financial Value of the Animal. Following Article 720, sign 1970 , under the ministry of wild life , fisheries and animal husbandry , which stated that any pet or wild life traveling from one state to another , must Ensure the life of the pets and all health Papers sign by the Authorities and the Owner of pet , before they are being delivered to their various destination.. THE TRANSPORTATION FEE HAS ALREADY BEEN PAID. THE PUPPY WENT IN FOR CHECKED-UP AT THE AIRLINES INSURANCE AND HEALTH CARE CHECKING DEPARTMENT OF THE ANIMAL AIRLINES (MINNESOTA) AND WE JUST DISCOVERED THE FOLLOWING. 1: REFUNDABLE PET INSURANCE. THE EVI REIMBURSEMENT DOCUMENT FOR THE PUPPY HAVE TO BE PAID BEFORE SHIPPING. WE REQUIRE THE REFUNDABLE INSURANCE REIMBURSEMENT COST FOR THE SAFETY OF THE PUPPY ON THE FLIGHT IN CASE OF ANY PROBLEM AS THE PUPPY WILL BE TAKING A DIRECT FLIGHT AT VARIOUS TERMINALS. THE INSURANCE COST IS REFUNDED BY THE DELIVERY AGENT UPON HIS/HER ARRIVAL FOR THE HOME DELIVERY OR AIRPORT PICK UP. AN EMBRACE PET INSURANCE POLICY PROVIDES REIMBURSEMENT COVERAGE FOR YOUR PET ELIGIBLE MEDICAL TREATMENTS, SURGERIES, LAB FEES, X-RAYS, PRESCRIPTIONS AND MORE, SO THAT YOU CAN MAKE OPTIMAL HEALTH CARE DECISIONS FOR YOUR PET BASED ON YOUR VETERINARIAN'S RECOMMENDATION, RATHER THAN ON THE COST OF TREATMENT. 2: PETS CHECKED UP. ALL PETS AND ANIMALS ARE CHECKED UP AT THE PET BAGGAGE DEPARTMENT PRIOR TO SHIPMENT. A VET DOCTOR IS RESPONSIBLE FOR THIS AND IT IS DONE TO ENSURE THE PUPPY HAVE MEET UP WITH REGULATIONS ON ALL VET CERTIFICATES AND HEALTH PAPERS. From the above, the Refundable Life Insurance fee you are supposed to pay is $875.00 for your Siberian Husky can travel through their lifetime world wide without any problems. You could use our Partial Insurance Scheme to Insure your Pet Life for half the cost of a husky which will be refunded to you once your Puppy at your door steps and you will have to pay an extra $15 for our services Which gives you a total of $875 for Your Siberian Husky named is(Nany and Milo) Insurance and the $875, will be refunded to you when you Ok!!!!! YOU WILL BE PAYING THE FUNDS TO OUR ANIMAL PET TRANSPORT INSURANCE HEADQUARTERS IN CHARGE OF ALL PET INSURANCE SERVICES WHICH IS THE INSURANCE HEAD BRANCH OFFICE OF OUR COMPANY. YOU WILL BE PAYING THE FUNDS USING WESTERN UNION BANK TRANSFER TO OUR INSURANCE HEAD BRANCH OFFICE OF OUR COMPANY TO THE DESK OF THE CASHIER NUMBER ONE. A: TO MAKE SURE THAT YOUR DOG IS UP TO DATE ON ALL VACCINATION. B: IT WILL HELP TO KNOW IF THE PUPPY HAVE ALL THE RABIES SHOTS OR NOT. C: WILL HELP TO KNOW THAT THE PUPPY HAS ALL AVAILABLE HEALTH PAPERS AND CERTIFICATE TO MAKE SURE THAT NO QUARANTINE WILL TAKE PLACE WHEN THE ARRIVAL YOUR LOCATION. ALL THE ABOVE HAS BEEN DONE AND THE PUPPY HAS BEEN CONFIRMED FOR SHIPPING. YOUR PUPPY TOOK SOME VACCINES THAT HAVE TO ENABLE HIS SAFETY ON THE FLIGHT. ALL THESE IS TO ENSURE THE SAFETY OF YOUR DOG UPON ARRIVAL AND DELIVERY. YOUR PUPPY HAVE NOT BEEN PUT ON THE FLIGHT BECAUSE OF THE REFUNDABLE INSURANCE AND VACCINES. TOTAL..................................................................................$875.00 (OF WHICH $860.00 WILL BE REFUNDED TO YOU IN FULL AND CASH UPON DELIVERY). STAY TO ENJOY THE SERVICE OF OUR DEPARTMENT. Dear Client Mrs David and Aaliyah!! This insurance scheme was introduced to protect the lives of animals or pets traveling within United States. This is because animals and pets have lost their lives and airlines or travel agencies have usually been forced to pay huge amounts as compensation. For this reason, the Life Insurance for Animals was introduced so that if anything happens to your animals during transportation in case of accident, wrong delivery lost or dead, the Agency will be free from any charge as the insurance will cover the compensation or fee place on them and not our agency. So you will be fully refunded by the Insurance company that insured your animal or pets Ok!!! .From the above, the Life Insurance fee you are supposed to deposit to our head office in chard of the life insurance of your two Pups is ($875 ) and your Huskies can travel through their life time through the US//EU without any problems. You could use our Partial Insurance Scheme to Insure the life of your puppies. This cost is half the cost of the full Animal Insurance fee . This guides the life of your pups only during this transportation and the fee will be Refunded to you in Cash once the Vet approves that your pups are Healthy after delivery. Normally you were soppuse to pay $1200 for the refundable insurance fee and due to the fact that you were not aware we have reduce the sum amount to easy the load on you.That is the best we can do at the moment. This means you will have to pay the sum of $875 instead of $1200 to insure the life of your Husky Puppies which is a Partial Insurance fee to guide the life of your puppies during this delivery and This is the Only solution at this time to get your puppies transported to you and the full amount will be refunded back to you upon arrival of your two pups. So as of request we will like to let you know all have been done in our power, but because of the following reasons above there is no way we can proceed without a valid and updated life insurance Certificate. we assured you that as soon we confirmed the payment we will issue the Refundable life insurance of your pups and proceed with the delivery Ok!!! You will have to comply with our terms and cooperate with us, so we can get a Partial life insurance permit processed in order that we can get your pups transported and delivered over to your home as soon as possible. The said insurance Certificate is Re-fundable upon arrival of your Siberian Husky Pups. If the insurance certificate is not provided within 24hours, we shall place the pups under PETS ABUSE AND ABANDONING, which is punishable by law according to the rules above. The cost of the Re-fundable Insurance Policy calculated by our statisticians calculated Below. I'm not sure what to think of this.... I really need some advice on what to do about this . Do not send any more money. The scammer may write you again threatening to report you for abandoning the fake puppies. This too will be a lie. The scammer is just trying to steal more money from you. Cut off all contact with the scammer. Ignore all his future emails. The scammer is actually in W. Africa. What was the original seller/scammers email address and text number? Did he have a website? Yea, I have the info he used. He used craigslist but his advertisement website got reported. Make sure you report it to your police, State AG and IC3. I most definitely will, thank you so much. I had a freak out when my boyfriend got that email from them. No matter what they write, ignore them. It is important to remember that there are no puppies. The scammers simply stole photos of puppies from legitimate website and pretended to have those puppies. The truth is they never had them and have never even seen them. QUEREMOS HACERTE SABER QUE.ESTAMOS LISTOS PARA LA ENTREGA, PERO NO PODEMOS PROCEDER EN ESTE MOMENTO PORQUE TU CACHORRO, NO ESTÁ ASEGURADO Y QUE SE HA QUEDADO EN EL AEROPUERTO INTERNACIONAL DE MATAMOROS TERMINAL 2. ESTO ES PARA LA SEGURIDAD DE SU CACHORRO Y NOTA QUE EL DINERO ES REEMBOLSABLE A LA ENTREGA. DEBEN DEPOSITAR LA SUMA 6000 PESOS , QUE SERÁ DEVUELTA A USTED A LA ENTREGA. SON CONSEJOS PARA HACER EL DEPÓSITO DERECHO AHORA COMO LO HIZO CON LA PRIMERA DE ELLAS QUE PODEMOS ENTREGAR EL CACHORRO HOY COMO SEÑALÓ POR PARTE DEL VENDEDOR. ESTE DINERO ES PARA EVITAR QUE EL CACHORRO CONTRA CUALQUIER IMPREVISTO QUE PUEDA OCURRIR DURANTE EL PARTO. SI ALGO LE PASA A SUS CACHORRO, AHORA QUE LOS CACHORRO ESTÁN BAJO NUESTRO CUIDADO Y SUPERVISIÓN, SEREMOS RESPONSABLES POR CUALQUIER DAÑO EN EL CACHORRO. ASÍ QUE POR FAVOR INTENTA ENTENDER CON UNION EUROPEA CON RESPECTO A ESTE PAGO Y TIENES QUE RÁPIDO DE HACER EL PAGO PORQUE TU CACHORRO HA ESTADO CON NOSOTROS DURANTE APROXIMADAMENTE 1 DIA. Detalles sobre el CHECK IN en línea serán llenados y enviado por correo electrónico a tu cuando confirmamos refinanciará poder cambiar de seguro. E.g llenó la reserva información y referencia de reserva con el apellido. USTED ESTÁ ASESORAMIENTO COPIE LOS DETALLES DEL PAGO DE NUESTRO CORREO ANTERIOR Y HACER EL PAGO LO ANTES POSIBLE PARA EVITAR FUTURAS COMPLICACIONES. EL SERVICIO DE GRAMO DE WESTERN UNION O DINERO TIENE 3 OPCIONES DE PAGO. WE WANT TO MAKE YOU KNOW QUE.ESTAMOS READY FOR DELIVERY, BUT WE CAN PROCEED IN THIS MOMENT FOR YOUR PUPPY, YOU ARE INSURED AND HAS BEEN IN THE INTERNATIONAL AIRPORT TERMINAL 2 Matamoros. THIS IS FOR THE SAFETY OF YOUR PUPPY AND NOTE money is refundable on return. MUST deposit the sum 6000 PESOS THAT WILL BE RETURNED TO YOU FOR DELIVERY. TIPS ARE DOING RIGHT NOW DEPOSIT as he did with the first one that we can deliver CUB TODAY AS NOTED BY SELLER. THIS MONEY IS TO AVOID puppy against any unforeseen event that may occur during childbirth. IF SOMETHING HAPPENS TO YOUR PUPPY, PUPPY now that are under our care and supervision, SHALL WE BE LIABLE FOR ANY DAMAGES IN THE CUB. SO PLEASE TRY TO UNDERSTAND WITH EUROPEAN UNION WITH REGARD TO THIS PAYMENT AND FAST DO YOU HAVE TO PAY FOR YOUR PUPPY has been with us for approximately 1 day. Details about online check-in will be completed and emailed to you when confirming refinance to change insurance. Eg filled reservation booking information and reference to the name. ADVICE YOU COPY THE DETAILS PREVIOUS PAYMENT OF MAIL AND MAKE PAYMENT AS SOON AS POSSIBLE to avoid future complications. SERVICE GRAM OF WESTERN UNION OR MONEY HAS 3 payment options. Abbiamo ottenuto una prenotazione per due (02) razza cuccioli ( SIBERIAN HUSKY ) sono registrati sotto il nomi ( LILLY & NINA ) e abbiamo ricevuto una somma di 55 EUR per la registrazione del cuccioli da Sgr. Davide Salvatore qui nel nostro aeroporto internazionale. Desideriamo inoltre informarla che il suo mittente ha pagato una somma di 55 EUR per il vaccino contro la rabbia e altri test del vostro cuccioli è stato fatto successo, quindi è a voi per pagare il biglietto che ti costa una somma di 250 EUR per il cuccioli. Vorremmo controllare il messaggio di seguito con attenzione per essere sicuri di consegnare il cucciolo a l'indirizzo giusto il 02 o 03 Giugno 2015. Le suddette informazioni saranno utilizzate per effettuare il pagamento direttamente al nostro ufficio. Accertarsi di effettuare il pagamento nel più breve tempo possibile, e il contatto ci riporta con la conferma del trasferimento. Invieremo l'orario dei voli del vostro animali domestico una volta che abbiamo ricevuto la conferma del pagamento. Quindi, non vi resta che andare al POSTE ITALIANE e chiedere il servizio MONEYGRAM ed effettuare il pagamento all'indirizzo abbiamo fornito di cui sopra. Se la tassa di trasporto non sono confermate con la nostra gestione centrale, questo cuccioli non saranno trasportati e resterà sulla detenzione della società fino a quando l'Amministratore Delegato conferma il pagamento di 250 EUR, in modo da essere sicuri di inviare una e-mail immediatamente, una volta il pagamento è fatto. Una volta che il pagamento è confermato dal CEO, il biglietto aereo del vostro cuccioli sarà attivata e l'orario dei voli sarà comunicato a voi per informare l'utente quando il cuccioli venire a casa tua, sei al 100% garanzia per ottenere il vostro animali domestico in casa tua sano e con tutti i documenti necessari. We got a reservation for two (02) breed puppies (SIBERIAN HUSKY) are registered under the names (LILLY & NINA) and we received a sum of EUR 55 for the registration of puppies from Sgr. David Salvatore here in our international airport. We also wish to inform you that your sender has paid a sum of EUR 55 for the vaccine against rabies and other tests of your puppies has been done successfully, so it's up to you to pay the ticket that costs you a sum of EUR 250 for puppies . We would like to control the message below carefully to make sure you deliver the puppy to the right place on 02 or June 3, 2015. The above information will be used to make payment directly to our office. Be sure to make the payment as soon as possible, and contact us back with the confirmation of the transfer. We will send the flight schedules of your domestic animals once we have received confirmation of payment. So, you just have to go and ask for service ITALIAN POST MONEYGRAM and make payment to the address we have provided above. If the shipping fee are not confirmed with our central management, this puppies will not be delivered and will remain on the holding of the company until the CEO confirmed the payment of EUR 250, so be sure to send an e-mail immediately, once the payment is done. Once the payment is confirmed by the CEO, the trip of your puppies will be activated and the flight schedule will be communicated to you to inform you when the puppies come to your house, you are 100% guarantee to get your domestic animals in your home healthy and with all necessary documents. The Italian was not written by a native speaker of any Romance language, but does not appear to be machine-translated either. I don't know enough about Georgian grammar, but Georgian has no gender, which could explain some of the errors. [email protected] This scammer is located in Africa and us using UK redirect telephone numbers to make it appear he is located in the UK. Following the UNITED KINGDOM Aviation Commission' Rules and Regulations on Pets Transportation and section 12 sub paragraph 2, "... the life of all animals being transported from or within UK must be fully Insured by an Insurance Co-operation against any eventuality. Following a compromise between the UK Aviation Complaint Commission and the UK Financial Commission, it was concluded that "The life of all pets being transported from UK to another Country OR within the states must be insured and this insurance fee would vary from one pet to another depending on Financial Value of the Animal." Pekingese Puppy is estimated for £940 . We know you should be asking why you were not informed about this prior to DELIVERY, and the simple problem is this, This Insurance scheme has been in place but can only be induce by the pet control and not the initial shippers. This insurance scheme was introduced to protect the lives of animals or pets traveling within and out of UK,ASIA,AFRICA and EU countries. This is because animals and pets have lost their lives, and airlines or Courier have usually been forced to pay huge amounts as compensation. For this reason, this Life Insurance for Animals was introduced so that if anything happens to your animals when it is on transit at any UK Airport or an airline you will be fully refunded or compensated by the Insurance Company that insured your animal or pet. Pekingese Puppy is £940 and the puppy can travel through out their life time within the states,Asia,Africa and EU countries without any problems. Pekingese Puppy is delivered to you at your home by the delivery man. In reality, you only loose £50 which you pay to us for our services. The second advantage is that: Your Puppy gets to travel across the States, ASIA,Africa and Europe for just £50 which you pay for our services since £890 is completely refundable. Details about the ONLINE CHECK IN will be filled and emailed over to your when we confirm Re-Fundable Insurance change. E.g filled out the Booking information and booking reference with last name. The Insurance and Quarantine service center for the UNITED KINGDOM PET CONTROL which is the first Port of check-out requires an Insurance Certification proceeding the shipment of this Puppy. If the insurance certificate is not provided within 24hours,we shall place this Puppy under PET ABUSE AND ABANDONING, which is punishable by law according to the rules above. YOU HAVE TO NOTE IT THAT THE INSURANCE FEE IS 100% REFUNDABLE. IN CASE THE PUPPY DIES OR GETS ANY DISEASE YOUR MONEY WILL BE REFUNDED BACK DOUBLE. PUG DOG ARE LISTED AS ONE OF THE MOST EXPENSIVE DOG BREED AND WE CAN NOT RISK THE LIFE OF YOURS. Annual coverage for Accidents and Illnesses. When your Dog becomes ill or injured, visit any licensed veterinarian of your choice anywhere in the world. Pay for your pet's treatment upfront and then submit a claim to us instantly in your customer account. We'll reimburse your choice of up to 70%, 80%, 90% or even 100% of your actual vet bill after an annual deductible. We can even deposit your reimbursement directly into your bank account / Cash. Claims are processed lightning fast - our processes most claims in just 2-5 business days! Dogs are notorious for finding trouble when least expected, which leads to unexpected veterinary visits and expensive vet bills. We believe treating unexpected accidents and illnesses should be a worry-free financial decision. With puppy insurance or dog insurance from Our Service, pet parents don't have to decide between their pets' care and over-extending personal finances. The Budget plan offers up to $1,000.00 in annual coverage for accidents and illnesses, including cancer and hereditary and congenital conditions, and is our most basic level of coverage. NB: WE SHALL REFUND YOU BACK AT YOUR DOOR STEP $1000.00 BECAUSE WE SHALL USE $10 TO PURCHASE THE INSURANCE PAPERS. WE WANT YOU TO PAY TO THE MONEY TO THE SAME ADDRESS BELOW SO WE CAN PROCEED IMMEDIATELY WITH THE TRANSPORTATION OF YOUR PUPPY AND YOU ARE GOING TO RECEIVE THE PUPPY ON TIME, BECAUSE WE ARE GOING TO PURCHASE THE PAPERS AS SOON AS THE PAYMENT IS BEEN CONFIRM, SO YOU HAVE TO MAKE THE PAYMENT AS SOON AS POSSIBLE SO WE CAN PROCEED IMMEDIATELY WITH THE DELIVERY OF YOUR PUPPY. ONCE THE PAYMENT IS DONE, Kindly email with the 10 digits (m.t.c.n.) That is the Money Transfer Control Number and the Names you used in sending the money as soon as the payment is done. EMAIL THE SCAN COPY OR CLEAR PICTURE OF THE PAYMENT RECEIPT SO WE CAN CONFIRM THE PAYMENT AND GET BACK TO YOU IMMEDIATELY WITH THE DELIVERY DEPARTURE AND ARRIVAL TIME OF YOUR PUPPY. WE SHALL BE WAITING TO READ FROM YOU WHEN YOU HAVE MADE THE PAYMENT. I am sorry to hear that you lost money to these criminals but I am happy to hear that your discovered the scam before you lost any more money. Please post the email addresses used by the fake shipping company and the pet seller. This information will help others avoid losing money to the scam.